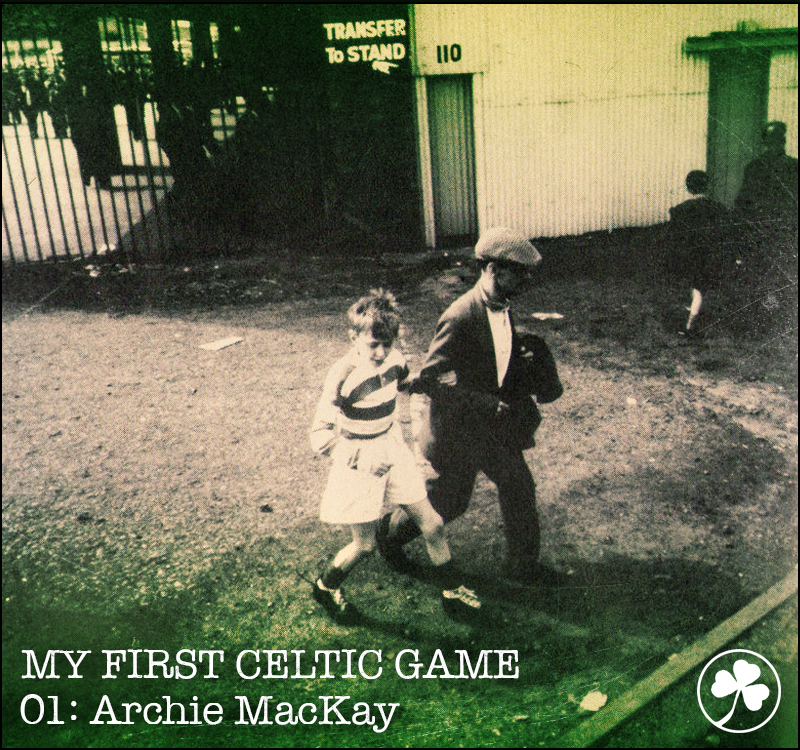 The first in a series of supporter recollections of the first time they saw the famous Hoops in action . . .
Carishaval, Bornish, Liniclate. Not exactly noted venues for watching football, unless you happened to grow up in the southern isles of the Outer Hebrides and one or more of your relatives played in the Uist and Barra Sunday League. Eriskay, another U&B League venue, on the other hand, has been ranked by Fifa as one of the top eight unique places to play football in the world. They should have seen Carishaval before it was returned to nature. It’s not exactly the enclosed wilderness of Cathkin Park; there are a few less hints that football was once played on its wild, open slopes, bordered by a loch, fenced crofts and the main, single track spine road through the centre of South Uist. When news made its way across the Minch to the mainland that Askernish, the nine-hole golf course on the island had originally been constructed as eighteen holes by the legendary Tom Morris Senior, the “discovery” was met with worldwide incredulity. How could a course set out by such a famous figure have remained hidden from the world for so long? Renowned course architect and sceptic, Martin Ebert, arrived to scour the dunes in search of evidence of the long abandoned holes. I followed him and master greenkeeper, Gordon Irvine, as they traipsed through the west coast machair excitedly pointing here and there at “clearly man made greens” where any other wanderer would see the never ending dune lands, undulating their way along the island’s exposed Atlantic coast. I’d bet a week’s wages that even Ebert and Irvine couldn’t find Carishaval’s football pitch today. We used to cycle to the games, my brother, my best mate and I, although not the games in Liniclate – that was about 25 miles north. Bornish was about 10 miles north, we could manage there and back on the bikes. For the Liniclate games we were offered a lift on the Southend team’s minibus. Can you imagine! Travelling with the team to the game. They might not have been Celtic players, but they were the guys who ran out onto the pitch on Sunday afternoon – the guys everyone had come to see – and when they arrived pitch side, all eyes turned. We strutted off the team bus as if fundamental to their success (in those years they were the team to beat) and we felt like champions. On the way home the players used to have a whip round and send us away with ten bob each. Fifty pence! It felt like a million dollars. My father was a goalkeeper for Southend – the south end of South Uist, not the one with the longest pier in the world. His playing days ended with a back injury during a home game at Carishaval – a pitch that sloped towards the large loch that skirted its south and west sides. Youngsters were strategically placed along the loch’s flanks to catch stray balls before they reached the water. The Wanderers goalkeeper – in later years exposed as a prolific kleptomaniac – wandered up the pitch to ask my prostrate dad if he could borrow his goalkeeper’s top for the rest of the game. It was a bright yellow – a modern (in the ‘70s) version of Johnny Thomson’s. Needless to say he never got it back. The Uist and Barra League was, and remains, a summer Sunday League, so there was never any impact on the professional football season. 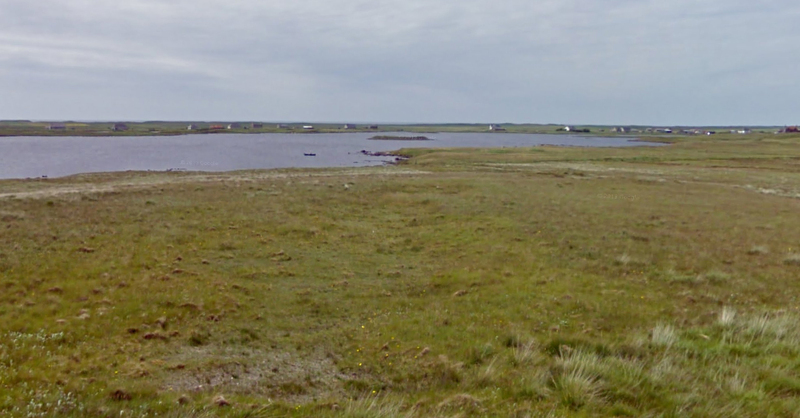 Everyone – literally everyone I knew in South Uist – was a massive Celtic fan: fathers, mothers, brothers, sisters. It’s still the same today; the Celtic top remains de rigueur and the radio remains the popular choice for listening to Saturday afternoon games. Satellite has taken over for live games of course (the mainland may take a long time to catch up with what’s happening in the islands, but the same doesn’t apply in the opposite direction). But this was long before regular live football on telly, which was reserved for enormously important occasions: cup finals, World Cups and the like. I remember a load of people coming round once for a cup final against a now defunct club. The black-and-white telly blew up pre-kick-off, but luckily one of my uncles was a TV repair man – that was an actual job in the days of tube-built televisions – and had his kit in the van. My two-year-old brother, with innocent childish curiosity, sauntered over while my uncle’s head was buried in the back of the telly, examining valves, and grabbed the unusual object propped up on the carpet beside him. It was a soldering iron, it was switched on, and he was clasping the wrong end. We learned all we needed to know about the dangers of grabbing hot soldering irons from his ear-splitting reaction. At least his lungs were in excellent working order, as was the telly shortly afterwards. I don’t remember taking much notice of the game, other than its obvious importance to the well-oiled adults in the house but, in my research, I note that we won our 25th Scottish Cup that afternoon, against the beasties, with an Andy Lynch penalty the solitary goal. Other than the rare showcase games, radio was the only available medium for live broadcasts. Radio Scotland medium wave to be precise, with commentary from the inimitable David Francey weaving in and out of the constant static. Poor reception interwoven with Francey’s dramatic style (if Celtic stepped over the halfway line it sounded like a goal was imminent) meant an edge of the seat listening experience. As his voice quickened and its tone rose invariably it faded into the rising static and by the time it returned you had no idea whether or not there had been a goal – judging by his excitement it could have been five each. The radio, and wonderful commentators like Francey and his successor David Begg, were the islander’s eye inside the fabled Paradise. Listening to those Saturday games, or the intensely dramatic European nights was like, as a child, listening to our grandmother recite the most gripping local folklore, one tale of which included a ghost dog at Carishaval. We had a large extended family, like all good Catholics (and lots of bad ones too), and most of them had had the good sense to bugger off and make lives for themselves on the mainland. Which was great for us because we had exotic uncles, aunties and cousins who came to visit each summer. My cousin Wullie was, unsurprisingly, a massive Tim. His family left Glasgow to make the Livingston new town their home in the early seventies and he made the journey to Celtic Park most matchdays on the supporters bus. He was about three years older than me. There were cousins in Uist the same age, but we hit it off – inseparable best mates every summer. ‘Come back with us and I’ll take you to a game,’ he suggested one year. I was still only twelve so chance was a fine thing, but the seed had been sown and the question persistently asked of the parents. Within a couple of years my brother and I were travelling unaccompanied to Livingston on holiday. It’s almost unimaginable now to think of halfway sensible parents allowing their kids to traverse the country alone, but the almost daily pleading since that first proposal probably wore them into submission. Our uncle promised to pick us up at St Andrew’s bus terminal in Edinburgh and return us there a fortnight later. If my parents had known anything about St Andrew’s, any notion of travelling alone to be dropped off in its grimy, pish-stained, junkie infested surroundings would have been instantly knocked on the head. We didn’t get to see Celtic that year. We had to be back for the start of school and the season hadn’t kicked off yet. No amount of begging to stay another two weeks until the Bhoys played was going to wash.
Joy unconfined, celebrated like a Celtic cup final victory. It was only a friendly, but it wasn’t just any old friendly. 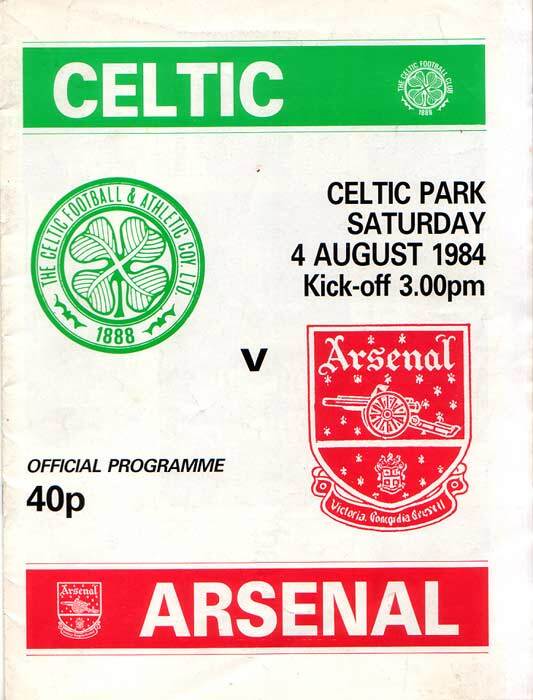 Celtic were hosting Arsenal and it was Charlie Nicholas’s first game back at Celtic Park since his unedifying exit. We couldn’t sleep the night before. So many questions for my cousin. What time do we leave? How long to get there? Where do we get the bus? Will it be full? What if it’s full before it gets to us? (That thought in particular appalled me.) How many people will be going? How will we know when we’re nearly there? I can’t wait, I wish we were going now! Wullie was calmness personified. He’d been there, done that, knew the routine. I marvelled at his cool demeanour. How could he be so relaxed? We were going to Celtic Park in 12 hours! The strange thing is, after all that time waiting, fantasising, dreaming of going to Paradise, I remember almost nothing of the game itself. Only a few patchy memories of the day remain. As we journeyed in to Glasgow I scanned the skyline incessantly, searching for it, desperate for my first glimpse of the Holy Ground. I couldn’t look round to engage in conversation in case I missed it as it appeared in my view. My cousin was teasing me – he knew exactly what I was doing and he was trying his best to distract me. But he couldn’t draw me away from the window, and then it was there. Those towering floodlights. That had to be it. ‘Is that it, Wullie, there?’ I asked, pointing. A knowing smile was the only answer I needed. 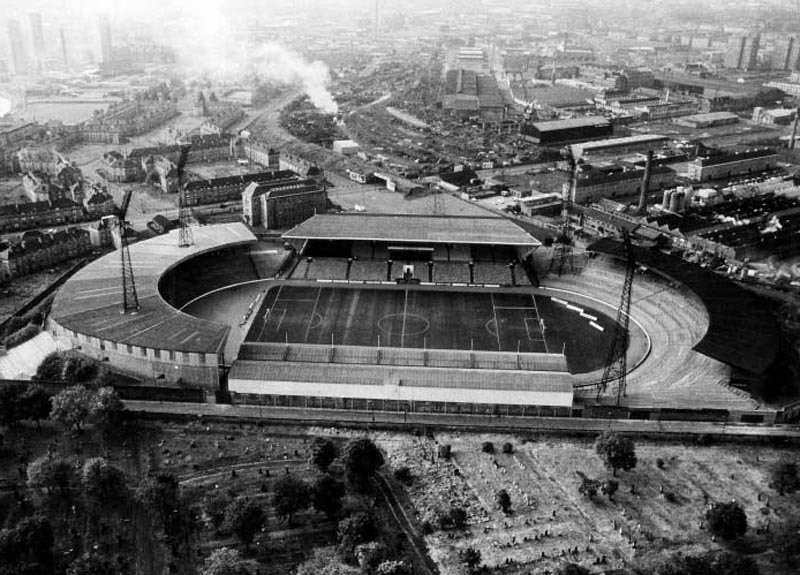 Celtic Park. Oh my God! There it is. That fabled place. The one off the telly. The one I’d sung songs about since I was able to talk. Our uncles at home had Celtic singles they played on the record player: The Celtic Song and Over and Over. I had known them since I was able to form words. We used to stand side by side singing them to our drunken uncles on boozy Saturday nights at my granny’s house. My stomach flipped. This was real. This wasn’t David Francey fading into static as Celtic surged forward. This wasn’t imagining where Tommy Burns was on the pitch with the ball at his feet. In a few minutes I’d see the ball at his feet. 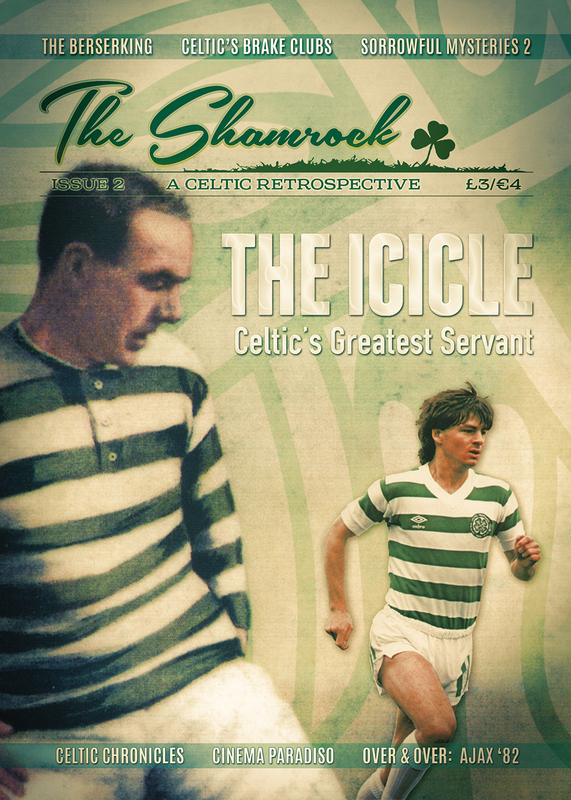 I’d see it in Packie Bonner’s grasp, I’d see Danny McGrain stopping an attack – by Charlie Nicholas of all people, my hero until he abandoned me, sucked in by the champagne London lifestyle. I remember the distinctive smell of it: the chippie on London Road, the burger vans. 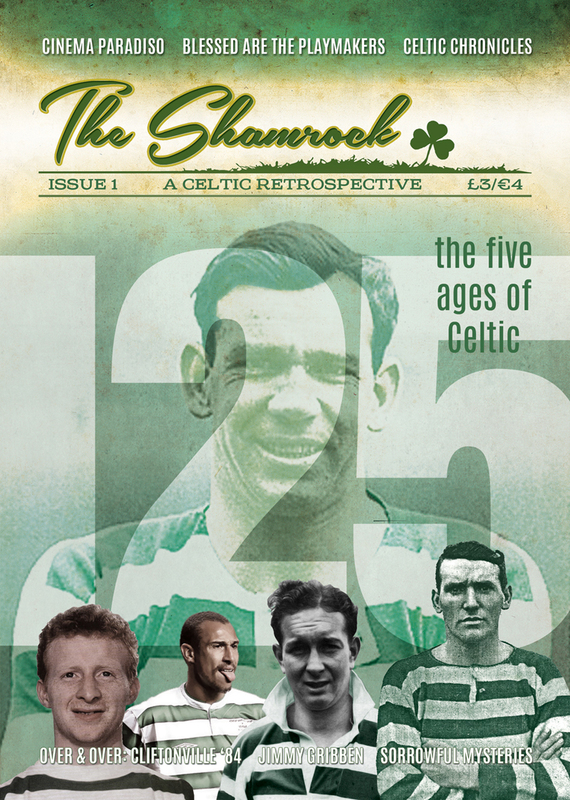 I remember the noise of it: ‘Programme, err a match programme’; ‘Hats, scarves, badges and tapes, err a hats, scarves, badges and tapes.’ I remember the bustle of it: everyone hurrying to the turnstiles, eager to get inside, a mass of people all with a shared purpose, all brothers and sisters in the Celtic family. We bought a scarf each and wrapped its green and white warmth around our necks. We were about to lose our virginity and become proper Celtic fans. I couldn’t take my eyes off the lights until we turned that corner and there it was – Paradise! In all it’s fabled glory! We sat in the main stand. Wullie said he always went to the Jungle but assessed that we weren’t ready for that yet. I looked around me in awe, drinking it all in, sucking the entire ground, the grass, the stand, terraces, smells, sounds, absorbing every atom of it. It was like an out of body experience it was so difficult to believe we were actually here. That grass – that green, green football pitch where Celtic players played. And there they were, out there warming up. Not even noticing we were there for the first time, not bothered that folk were gawping at them in devoted adulation. Celtic won the match three-two and the two things I remember are: that Pat Jennings, the colossal, legendary Irishman was playing in goal for Arsenal and that John Colquhoun shimmied past what seemed like half the Arsenal team before thumping a 35 yard screamer past his flailing hand. Wullie said it was the best goal he’d ever seen scored at Celtic Park in the ten years he’d been going. And we were there that day to see it too.